For Professor V.S. Mani eschewing violence was the precondition for international legal order of which courts and tribunals are a central feature. Disputes among states, for Mani, were inevitable. Such inevitability calls for the peaceful settlement of international disputes (PSoD) through negotiation, inquiry, mediation, conciliation, arbitration, judicial settlement, resort to regional agencies or arrangements or other peaceful means. Mani's argued that States are continuously obliged to strive for peaceful settlement of a dispute; the obligation remains unfulfilled so long as the dispute remains unresolved. Mani's doctrine of "continuous obligation" is essentially the postcolonial side of Hersch Lauterpacht’s articulation of the doctrine of the judicialization of political disputes. 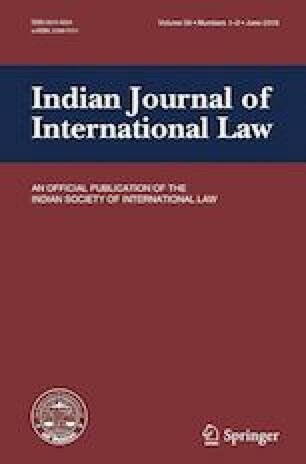 The article presents a reading of Mani's body of work through an International Relations perspective. The paper concludes by pointing out to Mani's role in the Nauru case. I thank two anonymous referees for very constructive comments.